Is There a Sound Defense Against the Somali Pirates? 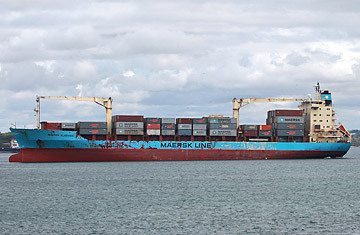 The U.S.-flagged Maersk Alabama, leaving the Port of Mombasa, Kenya. The pirates are at it again  and with the same ship. Last April, they took over the Maersk Alabama off Somalia and held the ship's skipper, Capt. Richard Phillips, hostage for five days. The U.S. Navy rescued Phillips after SEAL snipers killed three of the pirates and took a fourth into custody. On Wednesday, four would-be pirates in a skiff approached the Maersk Alabama some 650 miles off Somalia. This time, however, the crew aboard the Maersk Alabama had a brand new line of defense: a Long Range Acoustic Device (LRAD). It's a $30,000 loudspeaker that is used to first verbally warn an approaching vessel that it is getting too close. If the intruder continues towards the ship, the LRAD can be cranked up, generating a painful high-pitched screech that can be aimed at the approaching vessel. Despite the expensive new weapon, the pirate skiff plowed right through sound waves that should have sent the privateers scurrying in the opposite direction. Ultimately it took gunshots fired by a four-member security team to drive the pirates away after they came within 300 yards of the Maersk Alabama. The lesson: lead still beats loud. And that's part of a controversy. A senior U.S. Navy official said that this is the first time since the plague of Somali pirates erupted in the Indian Ocean that a major cargo shipping line deterred pirates with gunfire. While commercial shipping lines have been leery of hiring armed security forces for their vessels, "we clearly think that if you value your cargo, you need that last line of defense," said Vice Adm. Bill Gortney, commander of the U.S. Navy's 5th Fleet responsible for the seas in that part of the world. Gortney's opinion, however, clashes with the U.N.'s Maritime Safety Committee, which recommends against "the carrying and use of firearms by seafarers for personal protection or for the protection of a ship." The U.N. fears that arming ships will simply lead to more shooting on the open seas. Shipping companies have been eager to find ways to deter piracy without running the risk of starting a shooting war, but the quest for a reliable non-lethal means of curbing piracy remains elusive. On Wednesday, the pirates "fired upon the ship, and the embarked security team responded with warning shots, and the pirates fired back, and the embarked security team fired back  and there was no piracy event," Gortney said. All aboard the cargo ship were reported safe; it was not known if the pirates suffered casualties. "There was an LRAD deployed, but it did not appear to be effective," Gortney said. Unfortunately, that has happened before. "There have been embarked security teams that did not have weapons and were using LRADs and other things of that nature and they proved ineffective," he added. Robert Putnam of American Technology Corp. of San Diego, which makes the LRAD, says it should be viewed not as a weapon but as an early-warning system. "It's an acoustic hailing device that's highly effective in determining intent and creating standoff and safety zones in piracy applications," he said. Gortney called the LRAD "a terrific non-lethal weapon," and said cargo ships plying those waters should also use other means  slippery foam and barbed wire around ships' entry and exit points  to ward off pirates. But kinder, gentler techniques have their limits. "At the end of the day, if your opponent has an AK-47, the LRAD is not quite as effective as that AK-47," he said. "A well-placed round from an M-16 is far more effective than that LRAD."